A stream is a body of flowing surface water of any size, ranging from a tiny trickle to a mighty river. The area from which the water flows to form a stream is known as its drainage basin. All of the precipitation (rain or snow) that falls within a drainage basin eventually flows into its stream, unless some of that water is able to cross into an adjacent drainage basin via groundwater flow. An example of a drainage basin is shown in Figure 13.4. 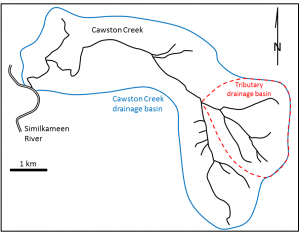 Cawston Creek is a typical small drainage basin (approximately 25 km2) within a very steep glaciated valley. 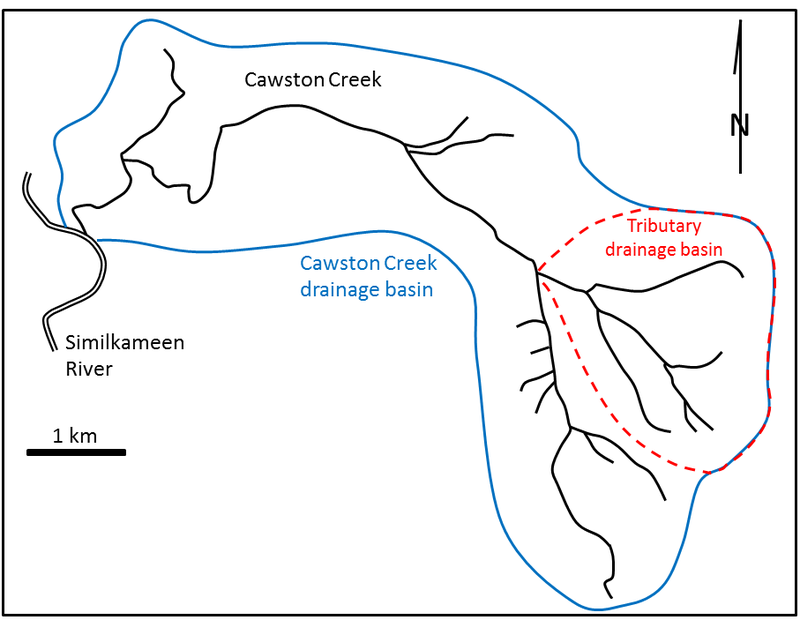 As shown in Figure 13.5, the upper and middle parts of the creek have steep gradients (averaging about 200 m/km but ranging from 100 to 350 m/km), and the lower part, within the valley of the Similkameen River, is relatively flat (<5 m/km). The shape of the valley has been controlled first by tectonic uplift (related to plate convergence), then by pre-glacial stream erosion and mass wasting, then by several episodes of glacial erosion, and finally by post-glacial stream erosion. The lowest elevation of Cawston Creek (275 m at the Similkameen River) is its base level. Cawston Creek cannot erode below that level unless the Similkameen River erodes deeper into its flood plain (the area that is inundated during a flood). 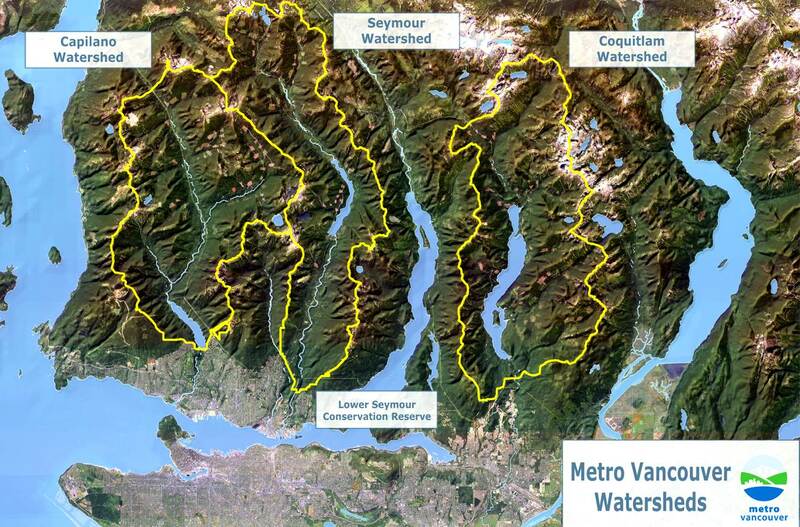 Metro Vancouver’s water supply comes from three large drainage basins on the north shore of Burrard Inlet, as shown in Figure 13.6. This map illustrates the concept of a drainage basin divide. The boundary between two drainage basins is the height of land between them. A drop of water falling on the boundary between the Capilano and Seymour drainage basins (a.k.a., watersheds), for example, could flow into either one of them. The pattern of tributaries within a drainage basin depends largely on the type of rock beneath, and on structures within that rock (folds, fractures, faults, etc.). The three main types of drainage patterns are illustrated in Figure 13.7. Dendritic patterns, which are by far the most common, develop in areas where the rock (or unconsolidated material) beneath the stream has no particular fabric or structure and can be eroded equally easily in all directions. Examples would be granite, gneiss, volcanic rock, and sedimentary rock that has not been folded. Most areas of British Columbia have dendritic patterns, as do most areas of the prairies and the Canadian Shield. Trellis drainage patterns typically develop where sedimentary rocks have been folded or tilted and then eroded to varying degrees depending on their strength. The Rocky Mountains of B.C. and Alberta are a good example of this, and many of the drainage systems within the Rockies have trellis patterns. Rectangular patterns develop in areas that have very little topography and a system of bedding planes, fractures, or faults that form a rectangular network. Rectangular drainage patterns are rare in Canada. In many parts of Canada, especially relatively flat areas with thick glacial sediments, and throughout much of Canadian Shield in eastern and central Canada, drainage patterns are chaotic, or what is known as deranged (Figure 13.8, left). Lakes and wetlands are common in this type of environment. A fourth type of drainage pattern, which is not specific to a drainage basin, is known as radial (Figure 13.8, right). Radial patterns form around isolated mountains (such as volcanoes) or hills, and the individual streams typically have dendritic drainage patterns. Over geological time, a stream will erode its drainage basin into a smooth profile similar to that shown in Figure 13.9. If we compare this with an ungraded stream like Cawston Creek (Figure 13.5), we can see that graded streams are steepest in their headwaters and their gradient gradually decreases toward their mouths. Ungraded streams have steep sections at various points, and typically have rapids and waterfalls at numerous locations along their lengths. A graded stream can become ungraded if there is renewed tectonic uplift, or if there is a change in the base level, either because of tectonic uplift or some other reason. As stated earlier, the base level of Cawston Creek is defined by the level of the Similkameen River, but this can change, and has done so in the past. Figure 13.10 shows the valley of the Similkameen River in the Keremeos area. The river channel is just beyond the row of trees. 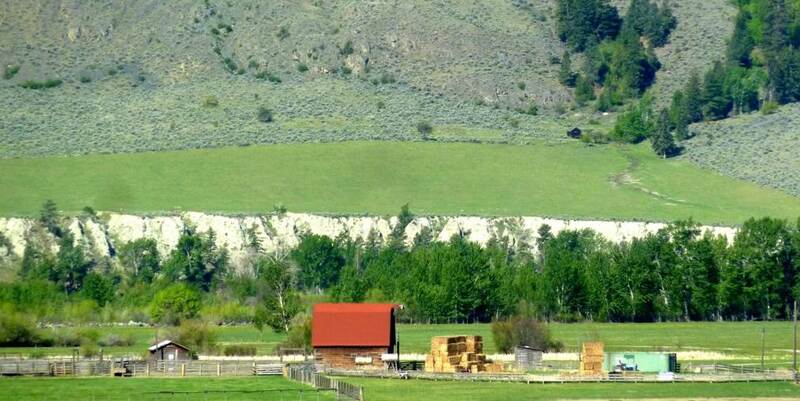 The green field in the distance is underlain by material eroded from the hills behind and deposited by a small creek (not Cawston Creek) adjacent to the Similkameen River when its level was higher than it is now. Sometime in the past several centuries, the Similkameen River eroded down through these deposits (forming the steep bank on the other side of the river), and the base level of the small creek was lowered by about 10 m. Over the next few centuries, this creek will seek to become graded again by eroding down through its own alluvial fan. Another example of a change in base level can be seen along the Juan de Fuca Trail on southwestern Vancouver Island. As shown in Figure 13.11, many of the small streams along this part of the coast flow into the ocean as waterfalls. It is evident that the land in this area has risen by about 5 m in the past few thousand years, probably in response to deglaciation. The streams that used to flow directly into the ocean now have a lot of down-cutting to do to become regraded. The ocean is the ultimate base level, but lakes and other rivers act as base levels for many smaller streams. We can create an artificial base level on a stream by constructing a dam. When a dam is built on a stream, a reservoir (artificial lake) forms behind the dam, and this temporarily (for many decades at least) creates a new base level for the part of the stream above the reservoir. How does the formation of a reservoir affect the stream where it enters the reservoir, and what happens to the sediment it was carrying? The water leaving the dam has no sediment in it. 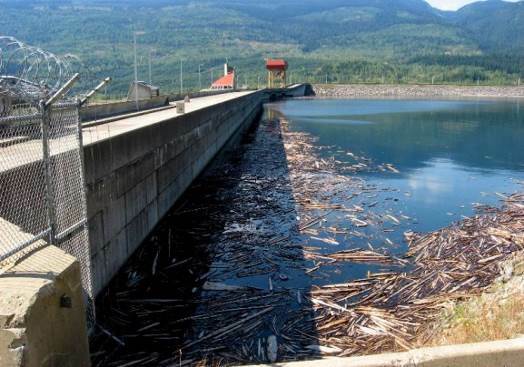 How does this affect the stream below the dam? Sediments accumulate within the flood plain of a stream, and then, if the base level changes, or if there is less sediment to deposit, the stream may cut down through those existing sediments to form terraces. A terrace on the Similkameen River is shown in Figure 13.10 and some on the Fraser River are shown in Figure 13.12. 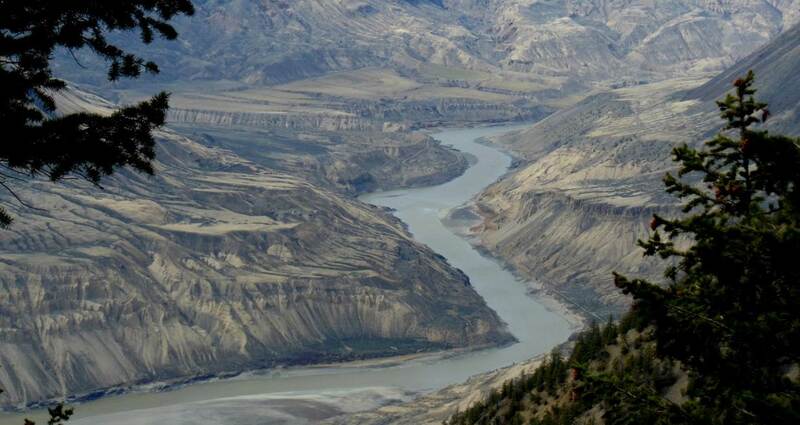 The Fraser River photo shows at least two levels of terraces. In the late 19th century, American geologist William Davis proposed that streams and the surrounding terrain develop in a cycle of erosion (Figure 13.13). Following tectonic uplift, streams erode quickly, developing deep V-shaped valleys that tend to follow relatively straight paths. Gradients are high, and profiles are ungraded. Rapids and waterfalls are common. During the mature stage, streams erode wider valleys and start to deposit thick sediment layers. Gradients are slowly reduced and grading increases. In old age, streams are surrounded by rolling hills, and they occupy wide sediment-filled valleys. Meandering patterns are common. Davis’s work was done long before the idea of plate tectonics, and he was not familiar with the impacts of glacial erosion on streams and their environments. While some parts of his theory are out of date, it is still a useful way to understand streams and their evolution. 13.2 Drainage Basins by Steven Earle is licensed under a Creative Commons Attribution 4.0 International License, except where otherwise noted.